With New Year’s Eve fast approaching, we’ve sussed out all the best parties happening on the Coast to ring in 2019. Whether you’re feeling a rowdy arrival of the new year or a more civilised affair, there’s something for everyone on our round-up of Gold Coast New Year’s Eve events. Celebrate the new year on Justin’s newly renovated rooftop bar! Enjoy the Coast’s best DJs back to back and dance the night away! Doors open at 5pm and the party will continue through until 2am, so make you’re wearing comfy shoes! Tickets are just $20, or splash out on an exclusive booth for you and seven pals for $600- all tickets are available here. Burleigh’s (soon to be) newest addition is welcoming the new year with a bang! Overlooking stunning Burleigh Beach with views stretching up to the Surfers Paradise skyline, enjoy sunset tunes, plenty of bevs, and local and international talent to farewell 2018 in true GC style! Pavilion restaurant, The Tropic, will be taking bookings, however general entry will need to be purchased at the door from 3pm. Get in quick, it’s tipped to be a sell-out! An opulent New York loft-style party is coming to Stingray this NYE. On arrival, attendees can enjoy a glass of Perrier Jouet, and later sip on a Grey Goose espresso martini or cosmo. The premium drinks package includes sparkling, red and white wines and beer and will run between 8pm-11pm. Food stations will include an oyster shucking station, bao station, Philly station serving up dry-aged Cape Byron steak rolls. YUM! To ensure you last until midnight, there will be loads of entertainment with live DJs and other surprises throughout the night. Doors open at 7pm, with celebrations continuing until 2am. Purchase your tickets here! Hideaway is throwing a Full Moon party in honour of the new year and you’re invited! Tickets include a four-hour drinks package, a Chandon pop-up bar, Chambord cocktails, food stalls, body paint (yes, we’re intrigued too!) and all the usual suspects from a full moon party! If you’re up for a boogie, their DJ will be manning the decks into the early hours of 2019. Tickets are $135 each or, if you’re quick, the first 50 tickets are available at the discounted price of $125. The event kicks off at 8pm and will be in full swing until 1am so get your tickets here! Keen for an award-winning NYE at a venue of the same standard? 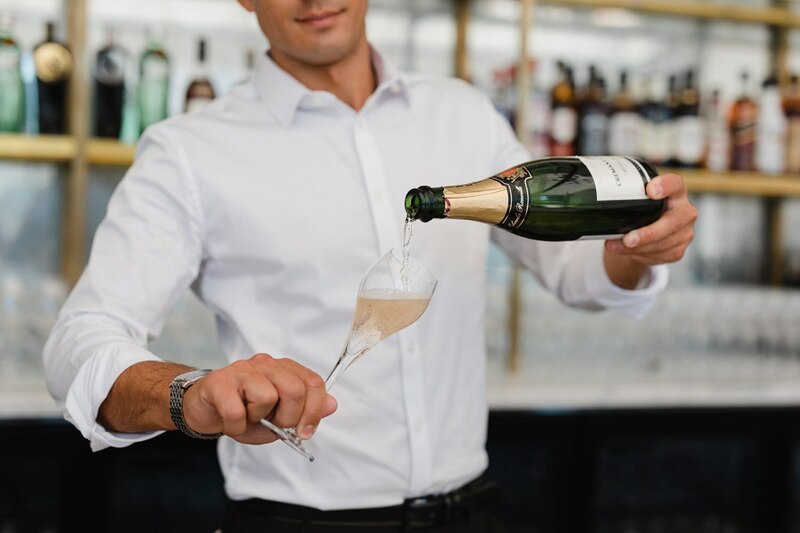 Kicking off at 7pm, guests will be greeted with a glass of prosecco on arrival at Fellini, before feasting on a six-course extravaganza including char-grilled seafood, oven-baked figs wrapped in prosciutto, pappardelle with duck ragu, and crispy skin Atlantic salmon- we are salivating! If you can find room, dessert will be Fellini’s famous ruby chocolate and 23-carat gold ingot on an almond sponge topped with raspberries. Bougie! Phone (07) 5531 0300 to reserve your table ASAP. Feeling those decadent NYE vibes? The Island is holding two #classyaf events this year! First choice is an elegant cocktail party on their pool deck with delicious canapes and a four-hour drinks package. Featuring live bands and DJs, immersive pop-up displays, roaming performers, special guests and three bars, this package will kick off at 8pm, and tickets are $149. Your second choice is a a penthouse party with a premium food and drinks package and 360-degree views of Surfers Paradise! The open-air terrace bar will host the party of the year, twelve floors up! Sip on a super premium beverage package with the likes of Belvedere vodka and Mumm Champagne from 8pm – tickets can be purchased here! Celebrate New Year’s Eve at Palazzo Versace with various decadent dining options. Whether you’re dining with family, friends or your special someone, you’ll be sure to enjoy the festivities! Il Barocco Restaurant will have an exquisite seafood buffet with two sittings from 5pm-7pm and 8pm-11pm. Their second dining destination Vanitas offers an elegant five-course tasting menu set to satisfy your tastebuds and includes paired wines, plus a glass of Ruinart champas on arrival! Roving entertainment will be on show, as well live music to carry you through to the midnight countdown. Grab tickets here! Want the best view in town to catch those NYE fireworks? Then look no further! Skypoint is offering a four-and-a-half-hour beverage package and three hours of food cheese and antipasti to keep you partying! Cuban culture will be on full display with salsa dancers, stilt walkers and fire performers to warm you up before the fireworks kick off! If Havana nights are your thing, be sure to grab a ticket here! Yamagen is set to celebrate its first New Year’s Eve with a BANG! You’ll be in safe hands with Yamagen’s talented bartenders who will be fusing classic cocktails with modern Japanese inspiration, using unique Japanese ingredients such as sudachi (Japanese citrus fruit), gyokuro (shaded green tea), yuzu bitters, and shiso leaf. You can also sample their 85 Japanese whiskies, which will be served with house-made, hand-chiselled ice blocks for premium purity and a slower melt time. Two menu options include delights like thinly sliced snapper, salt and pepper squid, and crispy skin quail. Tickets include food only, and include entry into Stingray’s NYE party- grab yours here! With a theme of “resort glamour”, you can experience all the glitz that NYE deserves at Sheraton Mirage this year! A grand seafood buffet and premium drinks package will be on offer at this adults-only affair come December 31, and a live band and DJ plus midnight fireworks at the resort will start the new year off with a bang! The menu looks pretty tantalising with a range of cold seafood, hot dishes, salads, food from the grill, and TEN desserts! The event runs from 7.30pm-1.00am and tickets to this glamorous occasion can be purchased here! Celebrate the New Year with the entire family and experience Terraces’ renowned seafood buffet featuring fresh seafood, delicious roasts, and a range of indulgent desserts this NYE. Be dazzled by the spectacular fireworks display at 8pm, but note that drinks for this event are not included in the ticket price – soit’s perfect for families or those looking to ease into 2019 a little slower! Sittings run between 5.30pm and 7pm – head here to reserve your sitting time! Wander a mosaic of food stations at Bazaar for 2019 New Year’s Eve celebrations. Begin your evening with a tour where your host will highlight the ever-changing seasonal menu and introduce you to Bazaar’s chefs. From there, let the feasting begin! Your plate will become your passport and there are no rules on which locations to explore! On offer is trawler-fresh seafood, crustacean and charcuterie bars, Asian delicacies, grill stations, a wood-fired pizza oven, and rotisserie just to name a few. Treat your tastebuds to a happy new year and buy your tickets here! Keen for an early night? Celebrations will be underway early at Bistro On3 from 5.30pm and round up at 8pm. Indulge in a sumptuous gourmet seafood buffet with all your favourites and enjoy live entertainment to kickstart your night. Bookings are essential as places are limited so get your mitts on some tickets by calling 07 5570 0383- all ages welcome! Where will you say cheers this New Year’s Eve on the Coast? Tickets to events are sure to sell out quickly. We suggest that you book early to avoid disappointment! - the gourmand who needs to find something to wear.